It is hot on August afternoons in Tel Aviv and even beneath the shade of the trees that line the elegant Boulevard Rothschild the air is sultry and still. But something is stirring in the summer heat. A tented village of protest now stretches up the narrow strip of land than runs between the two lines of traffic on the busy street. There are angry placards denouncing the government and complaining about the price of housing, of student life and of the most basic foods. The atmosphere is Tahrir Square protests meets Woodstock, meets last-year's-camping holiday in the South of France. A young man looks up from a group conducting a sing-song led by a bare-chested protestor playing a lyrical folksong on the balalaika. "Welcome to the Revolution," he shouts. Here and there you will find leather sofas or low coffee tables neatly arranged between the rows of tents - the chattering classes have taken to the streets. And, as we wander around chatting to the demonstrators, a young woman offers me an ice-cream from a box donated by a multi-national food corporation. It seems the revolution is to be sponsored too. But there is no mistaking the depth of the anger driving the demonstrations. And this is the kind of protest that governments hate. It is spontaneous - not the work of trade unions' organisers or opposition politicians. And it is not driven by concrete demands for specific concessions, but by a deeper and more generalised sense of discontent. It is not about the absolute strength of the economy either - Israel's growth and unemployment numbers are pretty good. The protests really are about how hard life has become for ordinary Israelis - the salt-of-the-earth, backbone of the country working and middle class families who work hard, pay their taxes, and uncomplainingly do their national service in the army. They want to know how they have ended up in a situation where they have Swiss prices and Greek salaries. And they are suspicious that corrupt politicians and greedy oligarchs bear a share of the blame. The catalyst for this summer of discontent was a protest that started on Facebook over the price of cottage cheese. That is not quite as eccentric as it sounds. To Israelis, cottage cheese is not just the gloopy, velvety, earthy, dairy product that you find in the chiller compartments of grocery stores all over the world. To Israelis it is the cornerstone of the traditional breakfast, the stuff you are weaned on, the food you miss when you're travelling abroad. So an angry, but largely online, protest movement began as Israelis noticed how much more their cottage cheese cost than its American, French or British equivalents. Manufacturers and shops were shamed into lowering prices - at least temporarily - and Israel celebrated a small victory for the little guy. The Israeli celebrity chef, Yisrael Aharoni, who lives in a penthouse apartment overlooking the tent city says cottage cheese has an importance to Israelis that outsiders may find hard to appreciate. "It is the taste of home," he says, "I don't think there's a home in Israel that doesn't have cottage cheese at breakfast." And he is not surprised that the issue awakened a deeper feeling of discontent among ordinary Israelis. He told me: "I am excited about it - I really hope and I do believe that it's going to bring a change. We haven't done it for so long and the excuse was always that our political situation was hard enough, but we can't buy this excuse any more." The focus then began to shift to the deep-seated problems in Israel's housing market and especially its chronic shortage of affordable starter homes. The problems are deep-seated and structural. Uniquely among developed nations, most land in Israel is a nationalised asset, owned and controlled by bureaucratic state agencies - a legacy of the leftist, collectivist instincts of Israel's founders. It may have made sound strategic sense in 1948, but it does not help people who want more houses built now. And the planning and approvals process too is the stuff of nightmares. So it is tough for young couples and lots of Israeli families spend a cripplingly high proportion of their salaries on rents or mortgages. 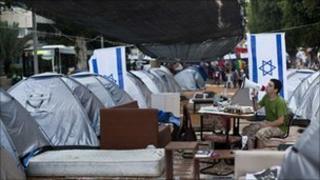 The cottage cheese protesters had shown the way, and so the tent cities were born - the biggest by far being the one in Tel Aviv. Gideon Levy, a columnist on the influential, liberal newspaper, Ha'aretz, argues that the sudden upsurge of Israeli protest is connected to the Arab spring. He is aware that some outsiders dismiss the Israeli protest movement on the grounds that where Arab revolutionaries were fighting for freedom of speech and the right to vote, Israel's are fighting for cheaper dairy products. He prefers to speak of a butterfly effect, transmitting the energy of protest from Tunisia to Egypt to Israel. "The goals are different and the system is different," he told me. "But the conviction is that crowds can count and that people have a choice. I truly believe that Egypt has given us a lesson." The Israeli government has looked a little rattled by this sudden sense of malaise - Prime Minister Benjamin Nethanyahu postponed a trip to Europe and a rather hasty-looking package of reforms has been assembled including a promise to build more student housing. But putting the genie of discontent back in the bottle will not be easy. Back at tent city, you get the impression that everyone to some extent is having their own revolution; one woman assured me that it was all about the growing difficulty of making a living as a street performance artist. At one level that makes the protestors weak. They don't have clearly defined objectives so it will be hard for them to argue that they've won and that their objectives have been achieved at any given moment. But that creates an even bigger headache for the cabinet. It now faces an uncomfortable summer dealing with the difficulty that all governments dread the most - a vague, but dangerous and spreading sense that all is not well.